Start with the interactive Magnet to revise positive and negative opinions. 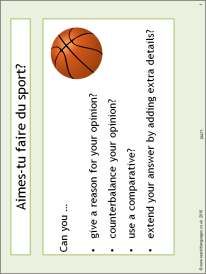 The PowerPoint will help students give opinions with reasons and also models how to extend their answers. Ideal for launching a group talk activity on the topic of sport.